In early December, I tagged along with Leonard Taylor, the author of "Trails Of The Huachucas", on a hike up to an old mill site in Miller Canyon of the Huachuca Mountains. 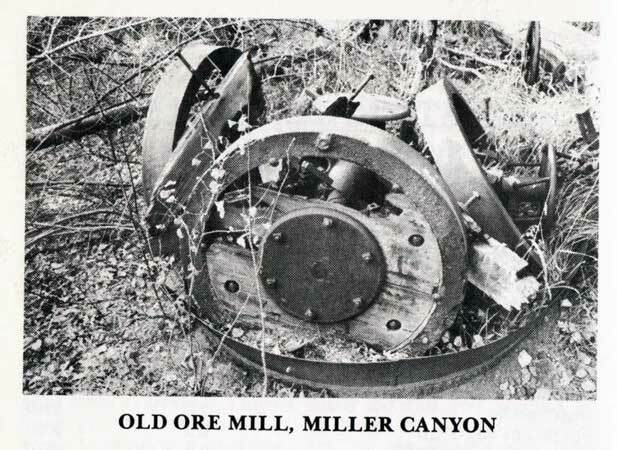 The earliest reference to the mill that I could find was a 1901 article in "The Cochise Review", a Bisbee newspaper. The article noted that the Huachuca Consolidated Development Compnay had placed an order for a slow speed roller mill that was expected to arrive and be installed shortly. It was written in a later article that the roller mill was working well and was matched up with a suitable engine and boiler. Over the next few years, shafts and tunnels were sunk on the claims and ore was stockpiled on the mine dumps. Test runs that varied from a few tons to a hundred tons of ore were put through the mill. But despite the amount of development work that was accomplished and the intense promotion of the mines, especially by J.S. Palmerlee, money could not be attracted to bring the operation into full production. It appears that by 1908, the end was near. 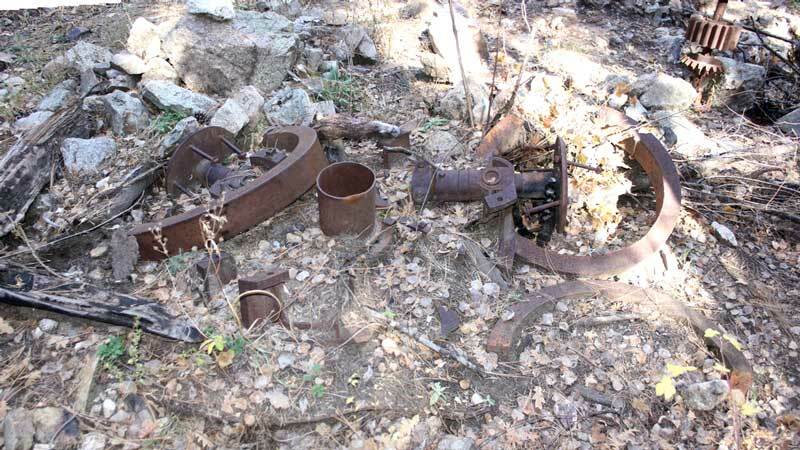 Remnants of the equipment from those early days can still be seen at the site today. The years have taken their toll, however. 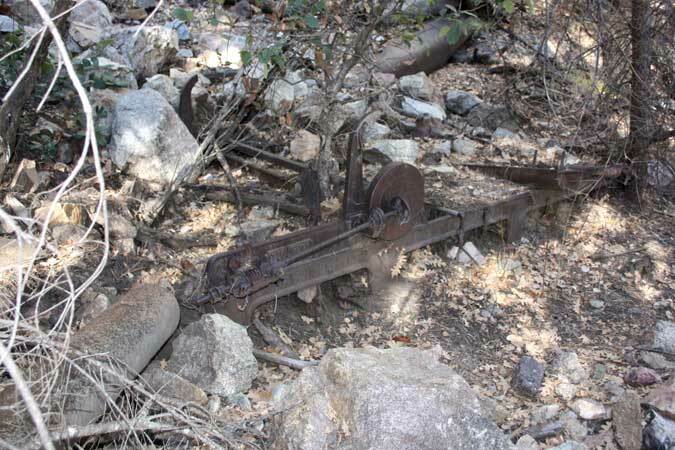 Besides the effects of the normal climatic conditions found at an alitude of 7600', forest fires and the debris flows that have occurred after the fires have worn on the old equipment. 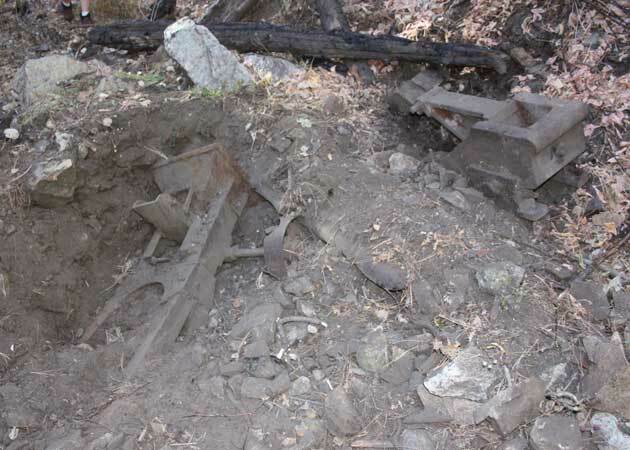 The iron main-frame section of a Joshua Hendy Triumph Concentrator Table can be seen at the mill site. I have seen quite a few Wilfley tables at old mills. This is the first of the belted Vanner type of tables that I think that I have ever seen. The Triumph machine was a shaker table that incorporated the motion of an endless belt to separate heavy metals from lighter mineral wastes. Ground up ore materials were dispursed onto the moving belt from a trough suspended over the framework. The heavier metal minerals would adhere to the belt and be carried around to be dropped into a tank under the machine. 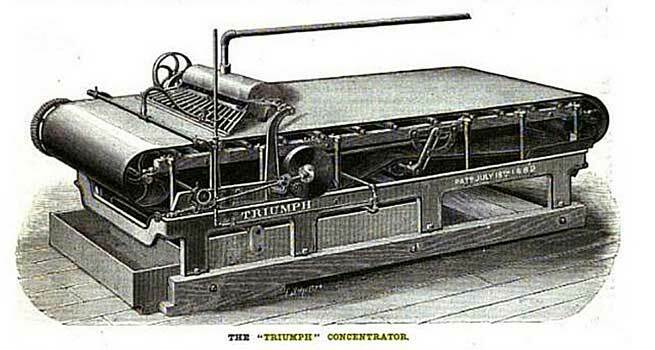 The Triumph concentrator first appeared in the mid 1800's and competed with another belt-type concentrator, the Frue Vanner. The major difference between the Triumph and Frue Vanner was that the Triumph machine was an end shaker while the Frue Vanner was a side shaker. A description of the operation and the parts of the concentrator tables can be found at this link beginning on page 619. The Triumph table weighed about 2000 pounds, but no single piece weighed more than 80 lbs. It was powered by less than a 1/2 hp engine source. Two to three gallons of water per minute were used in the operation of the machine. The concentrator sold for around $550. From what can be seen on the ground today of the remains of the old roller mill, it is difficult to understand what it is that you are looking at. A line drawing of a complete Lane Roller Mill together with a photo of how the old mill looked in the 1970's helps to put the pieces together. The effects of the Monument Fire of 2011 may have been the final blow for the old grinding machine. The 1970's photo is from an early hiking guide to the Huachuca Mountains written by Charles McMoran. 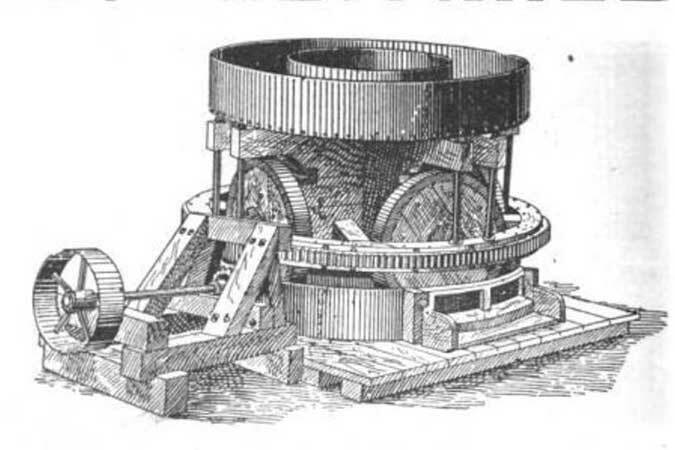 The roller mill was a modern version of the much older stone arrastra type of rock grinder. Newspaper articles from 1903-1905 speak to the desire of the operators to install a stamp mill. I did not see any evidence that that had been accomplished. 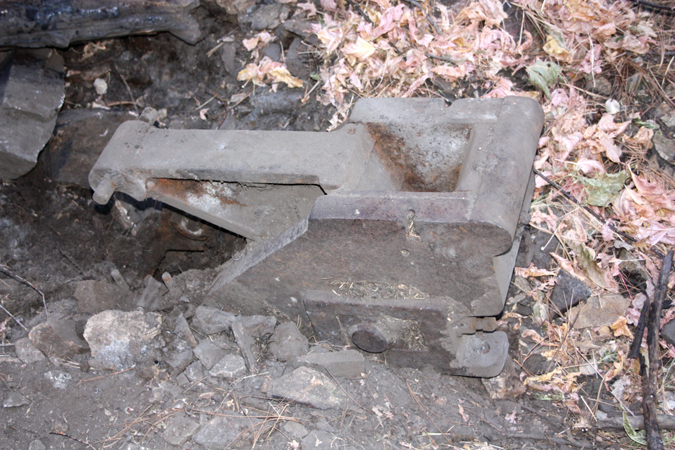 This small(8"-10") jaw crusher is at the mill site. If this was the primary crusher at the site, then that speaks to a very limited production from the mill. the trail passes through the ghost camp of Palmerlee, and two sets of springs whose discharge have been used by city of Tombstone 28 miles away.